Failed to get drafted out the Wallsend Swans in the early 80s Newcastle league. Joyrider on the Richmond karma bus. A bloke called J Harms has written a multitude of short stories, especially on Richmond during their troubled years. One in particular comes to mind when J Harms walked past a blue-haired, smoking, elderly female Tiger supporter at Jolimont Station. I still have a copy of it. Originally published in The Age. Barry Dickins has posted a few rippers here on the site.A few years ago now. P Flynn’s short piece on Stevie J is a masterpiece too. Thank you Dips. That John Harms bloke is certainly a leading contender to end up on this prestigious syllabus – just need to nail down a short reading. Barry Dickins is a good tip. I’ll look up P Flynn. There’s some great episodes in Phillip Gwynne’s Deadly Unna, particularly on Indigenous football, all in an under age context. It’s fun and probing and revealing. Based on real events on Yorke Peninsula. Richard Stremski’s depressing description of the 1981 grand final from the Collingwood perspective, from his 1985 History of Collingwood. Any of Garrie Huchesson’s fanboy hero worship items on various Carlton champions such as Bruce Doull. Years ago I remember jack Dyer had a column in the Truth newspaper, I don’t remember much about it except it was named Dyer ‘ear. I always expected it would have been a load of crap. If you can contact Bob Murphy to use or plagiarise just about any of his writings would be a good start. His mixed emotions when the Bulldogs won the ‘unexpected’ premiership in 2016 as told in his book ‘Leather Soul ‘ is well worth considering. His elation of course, but as the injured non-playing captain when the siren sounded, he had to ask himself, how should I get involved now? Do I run out and join the rest of the team or should I hang back because it is their triumph. He knew he would be criticised either way, and he was. Thank God for his coach presenting him with the coach’s medal that was praised by everyone. That moment when Luke Beveridge called him up to present the medal maybe the sporting story you’re looking for. Thanks for all your suggestions so far. Keep them coming! Dave Warner’s first novel City of Light (published 1995) is really a crime novel with undertones of politics (WA Inc.) Its narrator is a cop and footballer named Snowy Lane. 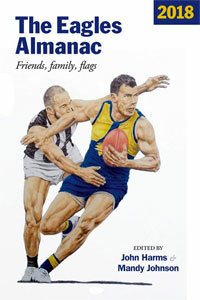 Although football is not the main theme there are a few pages about Lane’s footy matches with East Fremantle which are as good as any fictional writing about Australian Rules that I have read and better than most. Whimpress, B. 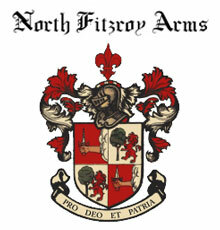 1878, Norwood Football Club’s First Year (with research by Michael Coligan) !!!! Many thanks for all the suggestions, everyone. I’m following up on the many leads now. Brent Crosswell has written some excellent articles which are worthy of consideration. You need some suggestions of pieces by women writers! My tip is to check out the collection called FROM THE OUTER, edited by Nicole Hayes and Alicia Sometimes from the Outer Sanctum podcast and published by Black Inc. in 2016. It includes pieces by Leila Gurruwiwi (from the Marngrook Footy Show), Angela Pippos, Sophie Cunningham and Alice Pung, among others. Thanks Edward! Katie, that’s a good recommendation … forgot about that one, thanks. Barry Oakley’s short stories “Walking Through Tigerland” – the title story is excellent and gives a great footy feel about the streets of Richmond on Grand Final day 1974. There are many names from the Almanac site Ben. Our contributors write so freely and authentically. Perhaps we could set up the challenge to them to write the sort of piece Brian is after. Just ask him for a brief. I think it’s a tremendous pre-season exercise. When I stumbled on a book called The Greatest Game (1988) my footy reading flourished. 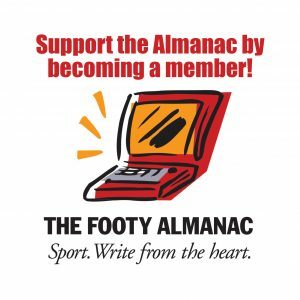 Ross Fitzgerald and Ken Spillman put together a collection of footy writing. Reading it in the early 90s I was drawn into its literary quality. The writers (some big names in this book) have something bigger to say. I suggest Dr Brian checks this book out, even though there are only a handful of what might be deemed short stories. 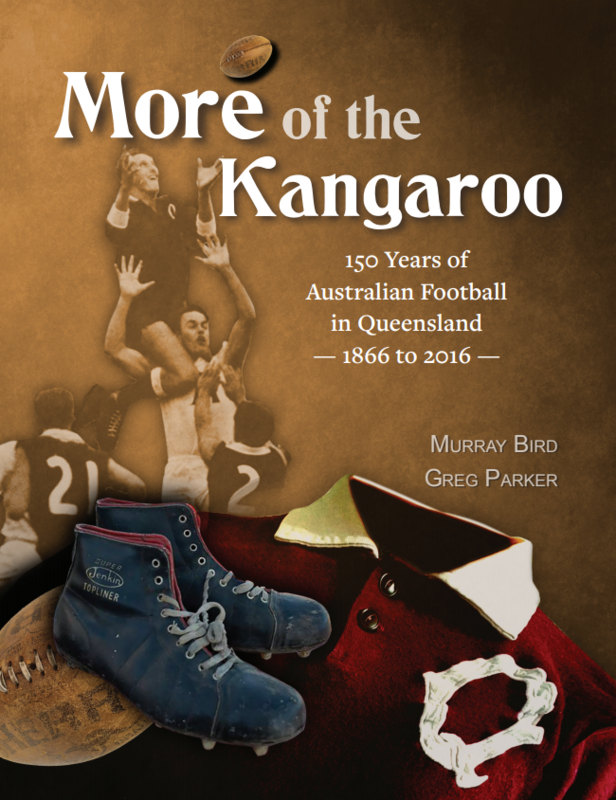 A new edition of the book was published by Geoff Slattery in 2013 (25th anniversary). It included a number of new pieces. It’s called ‘Australia’s Game’. 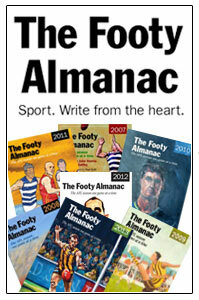 The AFL’s 150th Anniversary history is worth a look. The pieces in this are independent essays. Again this was published by Geoff Slattery. It’s nostalgia, modern day perception, humour, regret, relationships, the game’s skills and pathos all rolled together. And it’s an unmistakably Australian set of essays. I’m scratching my head, you’d think there’d be more short stories. I really love the way Garrison Keillor can write in shameless detail about baseball and make it sound literary and normal (oxymoron?). I’m sure there have been attempts, feel Tim Winton’s had a go but probably in his children’s fiction. Barry Dickins for mine is a lock for the creative non-fiction bracket you describe. The Great McCarthy, And the Big Men Fly and The Club show that we can handle longer stories on footy as long as they’re about country recruits. If Harmsy lets us do it, then I’d like to post my short story set at Hawthorn Citizens in 1986. It’s light on football detail though, more on social observation. My last attempt at fiction was going to be a novella about Preston’s centre-half forward from the mid-90s, whose team-mate I later discovered was Tony Wilson, “football novelist”. I loved his piece in From the Outer. Graeme Gardner – thanks for that. I thought I knew (and owned) every book vaguely connected with the Richmond footy club, but didn’t know that one. Will track down a second hand copy. Thanks to Chris and Noel for your suggestions too. It’s interesting that our game seems to have such a strong tradition of memoir, but relatively little ‘fiction’ (esp compared to say baseball). Maybe that’s the case for most sports? Or is there actually a dearth of fiction using our brand of footy as a backdrop? Discuss. 1. Fictional short story, not memoir (ok, most ‘fiction’ probably draws on actual experience, but this piece isn’t presented as such). 2. 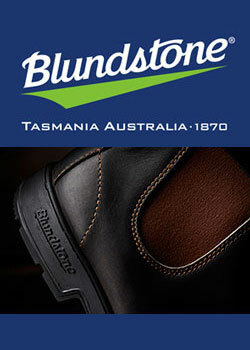 Australian football features prominently somehow (e.g. as setting, backdrop, vehicle, feature of a character or whatever). 3. Speaks to universal theme(s) and universal audience (i.e. it’s not necessary to be Australian and/or know the sport to be able to read it and say ‘that was a great story!’). An example of a recent novel that fits the bill (except for length) is Paul D. Carter’s novel Eleven Seasons, which won the Vogel I think. Michael Nichols, looking forward to your Hawthorn Citz short story as the first entry in this prestigious new literary showcase, which offers the prize of a Pellaco shirt, sports bag, Dons smallgoods and a David Honeybun footy card. Again, thank you all for these wonderful leads. John Harms—thank you. A used copy of “Australia’s Game” is on its way to my office at the moment. Katie—thanks for your recommendation too; I’m following up. I do not have enough pieces by women writers in my course now, so I appreciate this suggestion. Related to what Michael Nichols and Ben mentioned, I think it is challenging to identify good short fiction where Aussie rules, or any sport (other than baseball, boxing, or football/soccer) features as a major theme, metaphor, or backdrop in the story. It’s even more challenging trying to locate these pieces from regions/sports around the world in translation. That said, I’m always open to short story suggestions that touch on not only Aussie rules, but other sports, from writers around the world. If there’s a story from that world literature class you took years ago that you still remember, I would love to know about it.